First place: Artwear - a clothing brand that specializes in hand-painted dresses and tops. Second place: Band Runner- a competitive running IOS/Android app that allows two or more users to connect their smartphones and compete with one another in real-time. Third place: HytchCar- a social network exclusively for college students to share and connect based on car rides and travel locations. People's Choice: FliQ- created a faster, easier, and better way to connect and share with those around you using smart bluetooth that allows individual users, businesses, and organizations to find, connect and share contact information and content. The first, second, and third place winners will earn $3,000, $2,000, $1,000 respectively. The audience choice winner will receive $2,000. 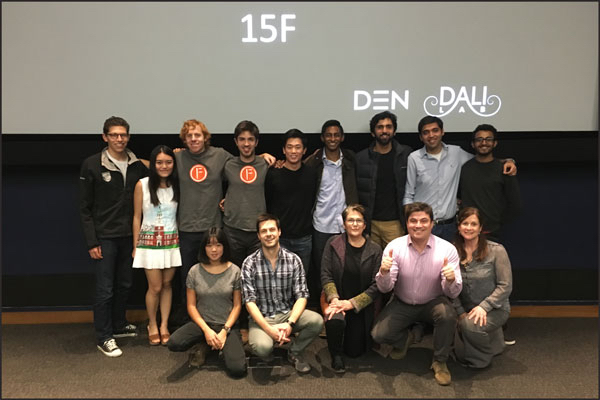 In addition to cash prizes from DEN, each of the winners receives design and development support from the DALI Lab (up to a $15,000 value). Teams were judged by a panel of judges assembled from DALI and DEN. Judges included: Lorie Loeb, Research Professor in Computer Science, Tim Tregubov, Technical Director at DALI, Jamie Coughlin, the Director of Entrepreneurship at DEN, Eileen O’Toole, Program Manager with DEN, Joshua Schoenbart ‘16, and Amy Zhang ‘17. Audience members voted for the People's Choice Award. The Winter 2016 Pitch will take place on February 25th. Applications will open January 15th and will be due February 15th. We encourage everyone with a creative idea to apply! DALI 15F End of Term Presentations!